New: Lots of Letters Cut Files! Gina has a video here demonstrating some samples with the different files. Here is just one way to use them. I chose to drop these open, perfectly spaced circles (they are grouped together in the file, so you don't have to worry about them moving around!) on a diagonal onto the scalloped mat, then sent to my Silhouette Cameo to cut. Next, place the cut mat over your card base and stamp the circles and letters inside, easy peasy! I also used the "three circle" cut part from another card I was working on that day (which I will share next Monday during our Inspiration Hop!) to stamp the word "pea". Isn't that fun? Completely customizable, making stamping and spacing even easier, and adds so many looks for your cards with amazing results! Circles are stamped in Memento Angel Pink and letters and image with Espresso Truffle. Card uses Pure Luxury Kraft and White, Seeing Spots CB folder, pea image from Garden Fresh. Finish with a bit of green bakers twine and pink gingham. Here's what the cut pieces looked like after sending to the Silhouette. See how you can also use the negative pieces for other projects? You can't do that with dies or punches! Each file contains all of the following shapes. Choose your favorite or get them all for fun mixing and matching! Tip: To use the unconnected circles for words shorter than 5 letters, select that chain of circles, duplicate, then ungroup and subtract the circles you don't want to use. 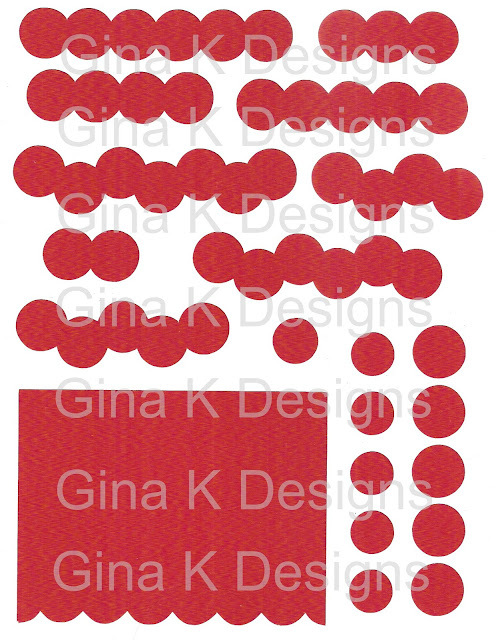 And here is the original Lots of Letters Studio file that will cut out all the shapes in the stamp set individually. If you want, for example, 6 cut "tile" pieces to stamp on, simply select that shape and duplicate 6 times in a new file to cut. 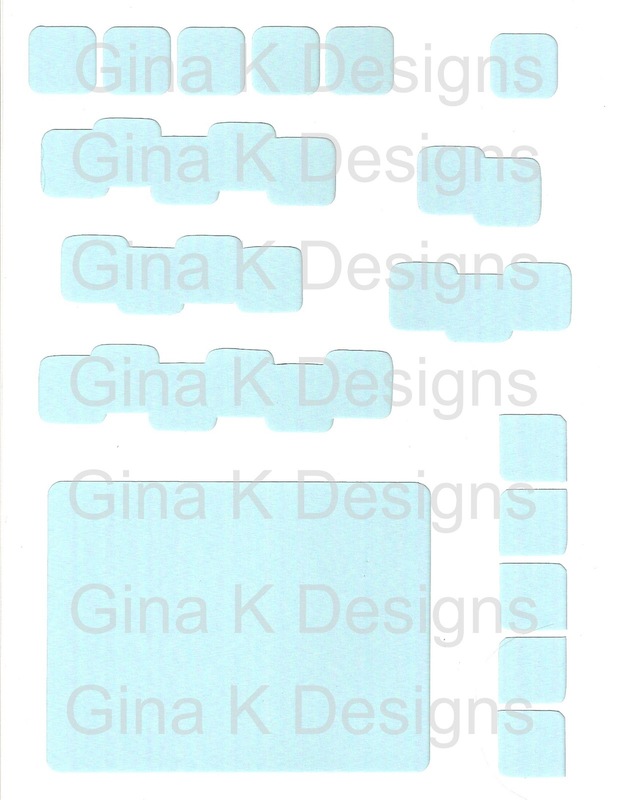 I heart my Silhouette Cameo, and these files take my new favorite set Lots of Letters to the next level! LOVE!! Very clean and simple card. Was just playing with my new Lots of Letters stamps when they first arrived (a warm up card) and some ink pads. Testing out stamping letters with no stamp positioner, woo hoo! I fit pretty much the whole Memento rainbow on here after adding the words! Cardstock is Pure Luxury White and Blue Raspberry. who is featured on Moxie Fab today! 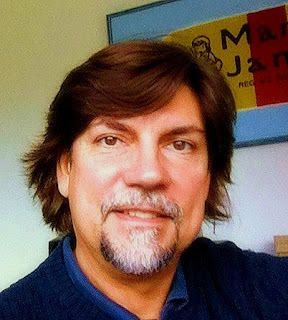 Please be sure to read the interview with this talented designer and GKD fan and leave him some love! 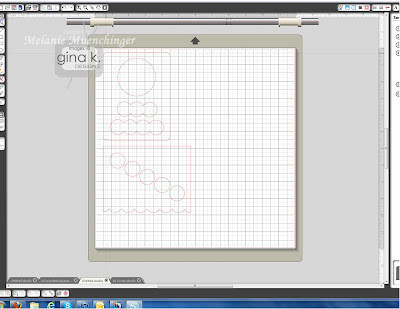 Thanks so much, Richard, for the shout out to Gina K Designs! Durring a little bout of insomnia, I found some mojo to work with some of my favorite sets that are being offered for free with a $35 purchase or more in the Black Friday-Cyber Monday special from Gina K Designs! (you choose which set you want from 6 preselected sets, one per order of $35 or more, no limit how many orders you place to get all the ones you want!) I will post more info on each of these individual cards later, but since today is the last day of the sale, I had to put them up now! Offer expires tonight at 11:59 PM Central, don't miss out! 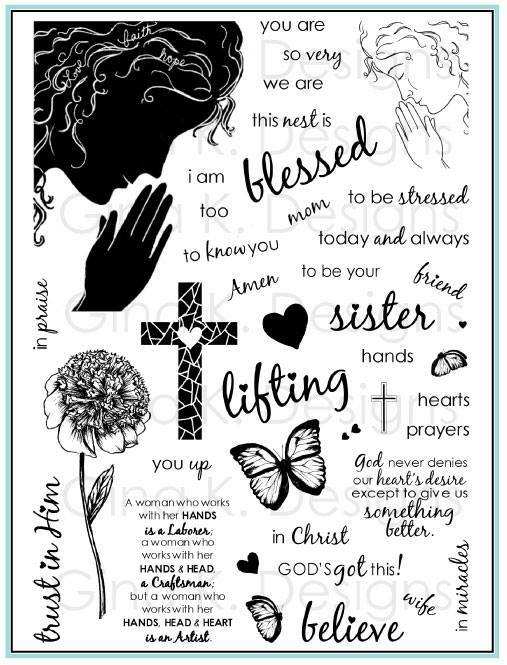 I used Lots of Letters with all of them, plus a sneak peek of three new Silhouette cut files designed for these letters, which will soon be available for purchase. So many ways to use these, files these are just a few samples of what to do with the cut outs, but wait till you see Gina's video using the negative portions. :) You will flip when you see all the options this adds to Lots of Letters! Hello! For today's card, I used Lots of Letters circle elements to make my own background with Memento colors Angel Pink, Lulu Lavender, Sweet Plum, and Grape Jelly. 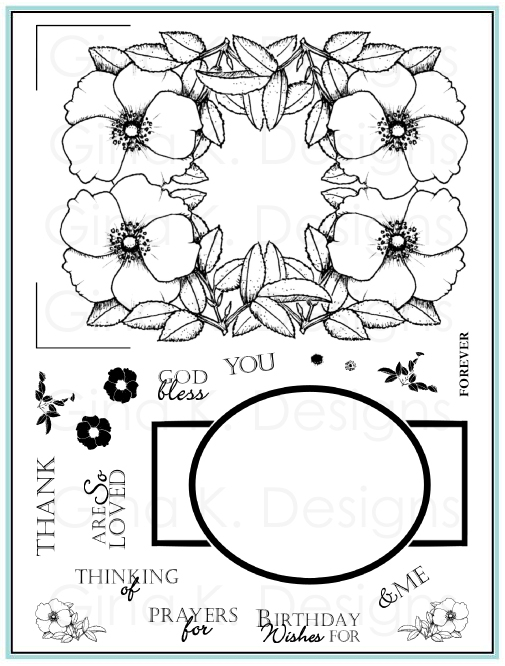 See how you can layer the the solid and double rimmed circle border, as well as the burst and coordinating rim (with the jagged edge) for two step stamping? I stamped a few of the letters directly onto the background centered in the circles, and then popped up a couple I punched out with a 1" circle add interest. 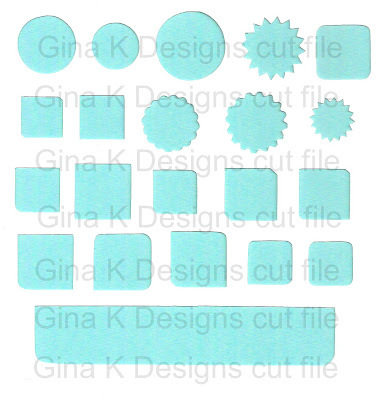 These circle images are also fun for adding buttons or flowers to the centers, just add glue dots. Cardstock is Pure Luxury White, Wild Lilac and Lovely Lavender. Minding your P's and Q's! I would like to know if you have noticed that the letters P and Q are missing from all the pictures that I have seen of the new LOTS OF LETTERS stamp? Is it a misprint or are those letters really missing from the real stamps? Did anyone else see that? Hope there hasn't been any confusion, I thought I had mentioned this earlier, but perhaps not! In this font, lowercase p and q are the same as d and b, just rotated! Not doubling up on those identical letters allows for room for more images. 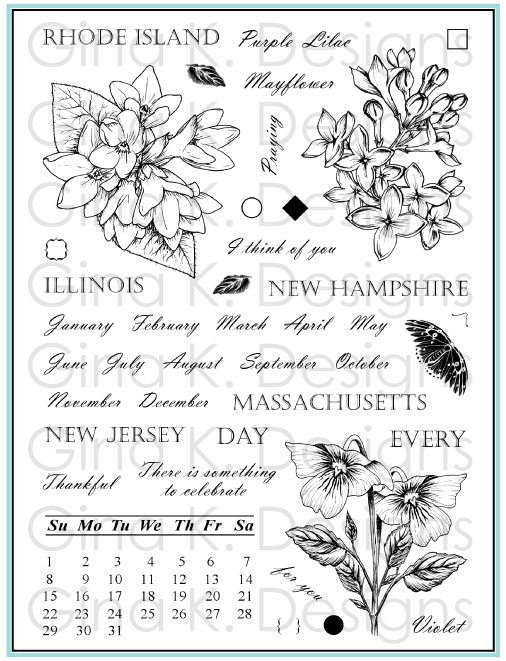 Today I have a very CAS card using Elegant Florals by Theresa Momber. On a Pure Luxury White base, stamp the calla lily and sentiment in Memento Tuxedo Black and stamp the silhouette image in Memento London Fog. Color the calla lilies with Copics YG00, YG23, BG96, and BV31. Emboss a Matting Basic B frame onto the base and then sponge over Memento Pear Tart ink concentrating at the left corner and fading up. Remove die. Add just a few adhesive pearls to the bottom. I could do this over and over again with different sentiments of flowers and not get tired of it! 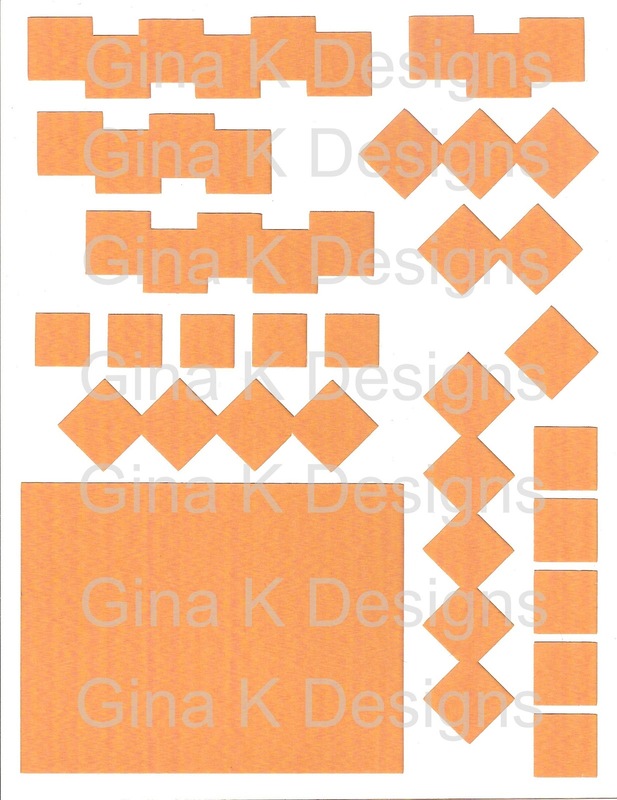 Edited to add: you can find the Spellbinders Matting Basics B set (and the A set!) at Blitsy right now for only 19.99, I highly recommend. Limited quantities available, through 11/28. Good morning! Here is a card I shared from the release party, I love the squares on a 45 degree angle as diamonds and how you can stamp up a quick argyle with two square images on the block at once. This design uses three different squares from the Lots of Letters set. Stack two bold square images from Lots of Letters on your grid line block, oriented like diamonds with the points touching. 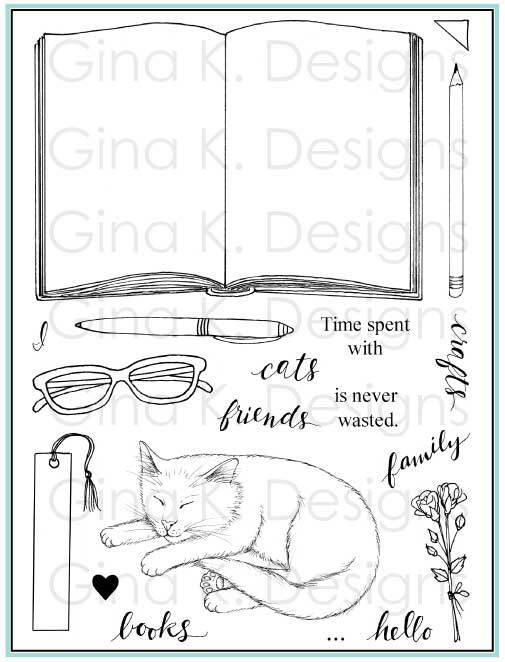 Stamp in the middle of your 4" x 5 1/4"white mat in Memento Summer Sky. Now turn your block180 degrees so the other square is on on top, re-ink, and stamp just to the right. Turn it back over again, re-ink and stamp to the right again. Now you have an alternating patten and two perfectly aligned rows. Repeat this process on the left side. Stamp the open square image in Summer Sky on cardstock scraps and trim with scissors or use the matching cut file or a 3/4" square punch. Stamp baby inside in Teal Zeal and pop up in between rows. I added these colored metal dots in between each for accents and embossed double lines above and below with a Scor-Bug and Scor-Buddy. White panel is mounted on Pure Luxury In the Navy and a Turquoise Sea base. Did you shop 'til you dropped? :) In addition to pounding the pavement for some clothes and gifts, I've been online, of course, and ordered the new Pure Luxury blues, bakers twine and some binder boxes. Sale specials last through Monday at Gina K Designs. Can't wait to put some samples together with these for you! I do love blue! 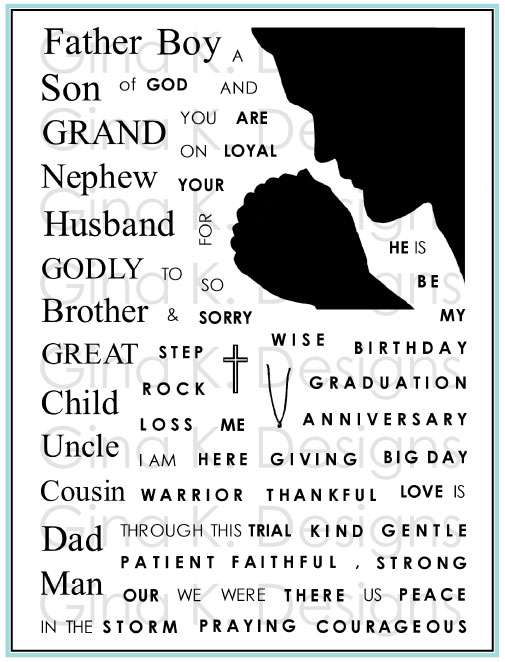 Here is a quick and easy card to mass produce with Lots of Letters for Christmas! I was so happy to have ordered this adorable Winter Trees CB folder, knowing that lots of letter was coming out this month! 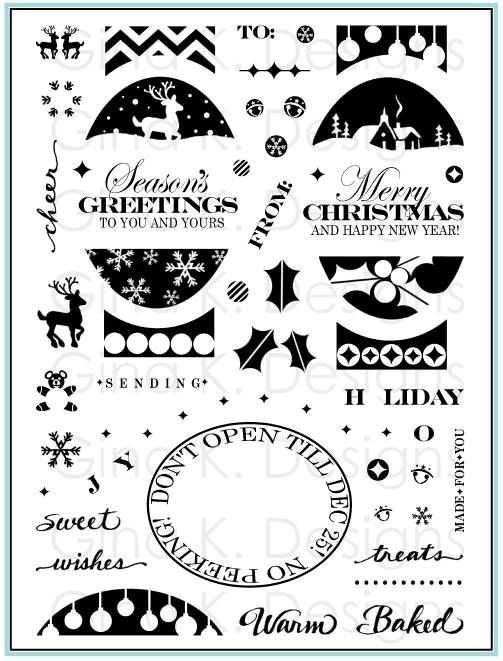 Look how perfect all the little circle elements will look with this embossed pattern and what simple Christmas cards you can make, and you can fold and emboss this one right onto the card base to leave a nice border! Stamp out two Memento Angel Pink bursts and one New Sprout green on white CS. Then stamp a Rhubarb Stalk "ho", a New Sprout "ho" and a "combo" "ho", hee! Punch out with 1" circle punch and mount onto Pure Luxury Fresh Asparagus and Cranberry Tart 11/4" circle punches. I added one big rhinestone on the middle "o" and popped them up over circles on the embossed pattern. ho ho ho! I also added a blingy crystal self adhesive flourish. That's it, a super fast, easy to mass produce card! LoVe! TIP: If you don't have the Winter trees folder, try it on plain white Pure Luxury base or emboss it with CB Christmas Countdown folder. 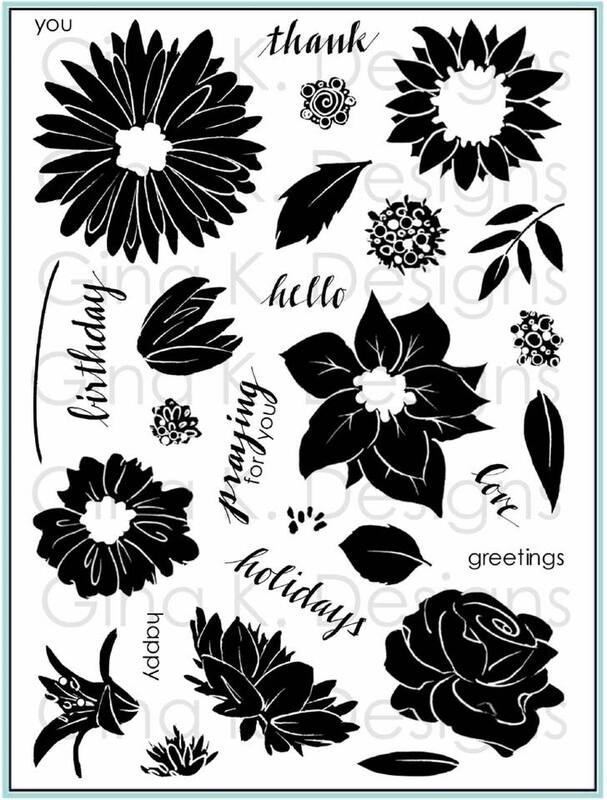 Black Friday at Gina K Designs- More Free Stamps! and even more Black Friday specials! Choose one of these great sets with your purchase of $35 or more in Gina K Designs merchandise! 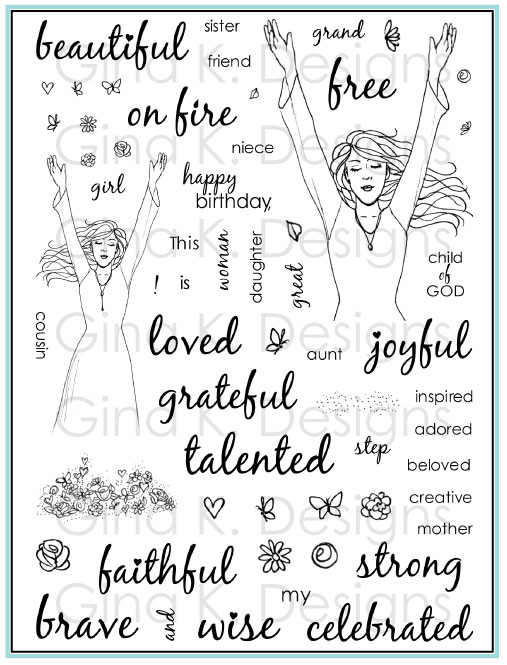 Type in stamp set of choice at checkout, or one will be chosen for you. 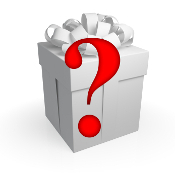 Have you seen The Mystery Package at Gina K Designs? Stuffed with at least $70 worth of crafting goodies, which could include stamps, ink, paper, punches, dies, etc, this goody box really will be like Christmas morning opening it up and seeing what Gina and the team has handpicked inside! Like a personal shopper gift straight from Gina K! For only $35, that's a savings of over 50% and would make great gift for a crafty buddy, too! No limit to how many you buy, but packages are limited, so get them while they last! Don't miss out on the fun! Shipping is free on orders of $50 or more, so don't forget to throw a few more things* you've been wanting in your cart! Hope you had a terrific Thanksgiving and some fun shopping or rest and relaxation and today and over the weekend! A very happy Thanksgiving to you all! The kids had a school holiday yesterday and we just hung around the house. I wanted to take a little break from cardmaking and do a few things to make it look a little more festive and prepare for company for our big meal today. (Sometimes as a designer I am always working ahead on the holidays to come, and it is easy to suddenly find myself on Thanksgiving day surrounded by a bunch of Christmas or Valentine crafts! I have to stop and live in the moment so all the fun of the current holiday doesn't pass me by!) I saw these cute trees made from canned goods and paper bags on Pinterest so William and I had to give them a try. Here is William's. We also made a few Silhouette cut leaves and embossed veins before tucking them into the branches. I also decided to make some leaf garlands with our FREE, abundant leaves after I saw the boys outside raking to earn a little money. This was so simple to do, just gather some nice looking leaves, thread a needle, poke through the middle of each leaf, space them just a few inches apart and hang up! I just tied them around our light fixture and then used clear tape in the corners, and well as just draping strands around our curtain rods in other rooms for swags. It was hard to capture a good pic of this, and didn't have good light last night or this morning. Hope you get the idea! :) I love how this easy and rustic treatment brought the outdoors in. I love Fall! So while you're waiting for the yeast rolls to rise this morning, give this simple project a try! I also saw adding corn to your candles, again really inexpensive way to complete the harvest look! Some of the latest bunny pics! They are now three weeks old and look just like fuzzy rabbits now, no more "naked mole rats"! This pic below was one at the TWO week mark. It has been very warm this week, so they are all out of their nest box now exploring the hutch. Here's one who decided it was better to sit the hay trough than eat it! Prayers for traveling mercies for you all this week and a peaceful relaxing time with whomever you are spending this day with: family, friends, or neighbors. If you aren't able to share a meal with someone today, I hope you have some nice phone calls and good times connecting with online friends. God is good! So much to be thankful for! Winner of the Show Me the Stamps Prize!